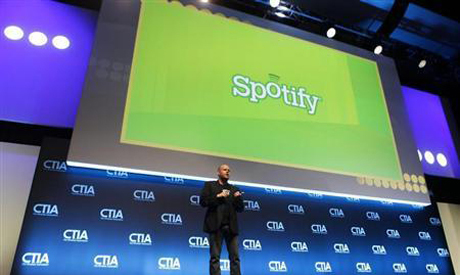 Music streaming web service Spotify more than doubled revenues in 2012 to 435 million euros ($577 million) as it expanded to new markets and almost doubled its users, documents showed on Wednesday. The Stockholm-based company, which provides free on-demand music or ad-free tunes for paying customers, posted a 58.7 million euro net loss, compared with the 45.4 million loss it had in 2011 on turnover of 190 million. The figures were filed by its holding company Spotify Technology in May and published on the website of the registry of companies in Luxembourg, where the group is registered, on Wednesday. The unlisted company, which has more than 20 million "active" users and over 5 million paying subscribers and has received financial backing from the likes of Northzone, Kleiner Perkins Caufield & Byers, Accel Partners and DST, would not rule out further fundraising activities to support its growth. "We cannot exclude the need or desire to raise more funds in the future to fund future growth initiatives," it said. Spotify, founded in 2006 by Swedes Daniel Ek and Martin Lorentzon, strikes royalty deals with record labels and pays about 70 percent of its revenue back to rights holders. Streaming and on-demand music has soared in popularity alongside smartphone use, but companies like Spotify and Pandora - which has almost 68 million active listeners - have struggled to make profits due to the cost of royalty fees. The sector has attracted keen interest from global technology giants like Google, Amazon.com Inc and Apple Inc which see music streaming as crucial to grow their presence in a smartphone-dominated media world. Spotify said that it almost doubled the number of monthly active users during 2012 as it launched in countries such as Germany, Australia, New Zealand and Ireland. This year, the company made its first forays into Latin America and Asia.